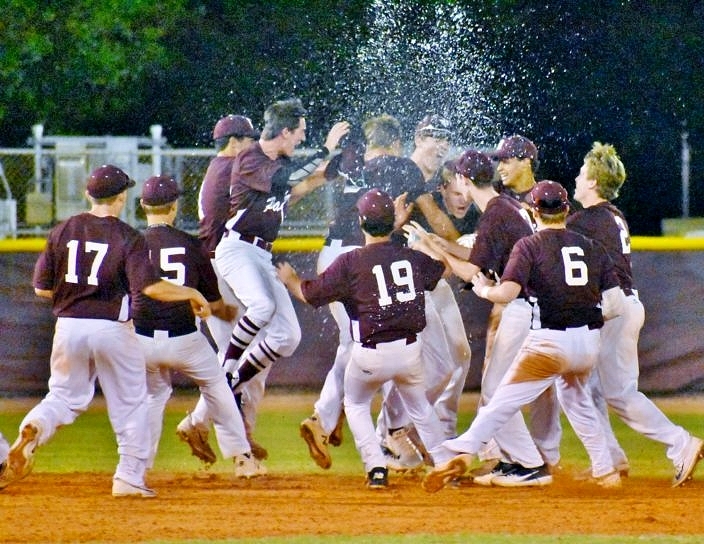 Dwyer (6-4) overcame a two-run deficit to defeat rival Jupiter (4-6) in dramatic fashion Tuesday night, emptying the dugout following Ben Guty’s walk-off delivery in the bottom of the seventh. It was a back-and-forth affair between the two teams in the contest, and the offenses each made their mark very early on in the game. After Connor Roth scored in the top of the first for the visiting Warriors, Phillipe Roy evened the game in the bottom of the inning, scoring on Dylan East’s infield single. For Dwyer’s bats, it was just the first time that they were be called on to help the team come from behind. And for East, it was just the first of four hits he had on the night, marking the second four-hit performance of his ever-productive season. In the third, Jupiter again tallied a run on Cameron Sorge’s advance — following a ground ball hit from Jack Sharpe. but this time, the Panthers took the lead in the bottom of the inning. Jacoby Long and Kyle Moore combined for a pair of high-chopper singles, sandwiching a sharp line-drive double down the right field line from Roy. The balance of speed and power from the trio helped the Panthers take their first lead of the evening. But the 3-2 score soon turned to 4-3 in favor of Jupiter. The very next inning, Nick Grieco scored the go-ahead run for the Warriors against relief pitcher Jack Bartolomei (unearned) — though Bartolomei came back with a crucial strikeout, ending the Warriors’ threat. 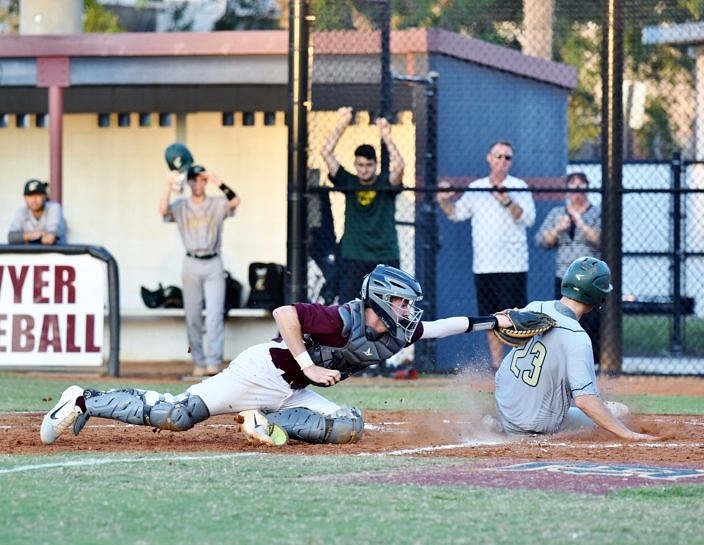 Jupiter added another run in the top of the fifth before the Panthers offense came to life in the later stages of the contest. 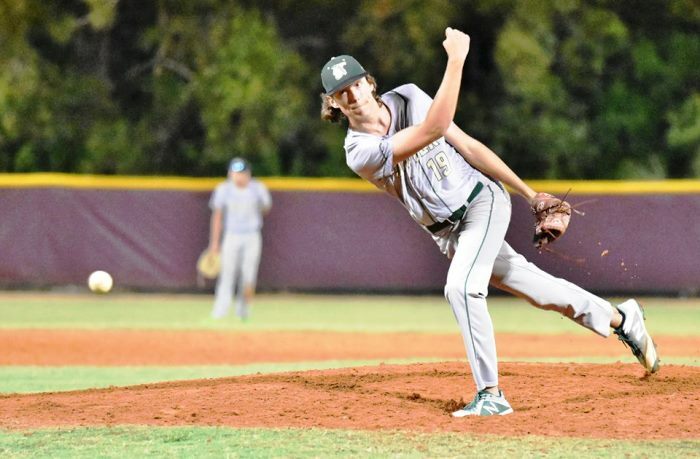 Though pitcher Duane Hoff struck out the first Panthers batters he faced in the bottom of the sixth, Dwyer called for a small-ball approach, and Eddie Hayes singled on a well-placed bunt. It was the catalyst the Panthers offense needed. Ryan Khachadourian singled, and Long added another hit, bringing Dwyer within a run and setting the stage for the home team’s spectacular seventh inning. It started when Moore reached on a hard ground ball to begin the inning, and continued with East notching his final hit of the evening. Sean Ng delivered the tying hit, a double to left, before Guty provided the magic — his winning single left him running from first base straight into the outfield, pursued by teammates who pressed him into the spotlight, launching water high into the air and celebrating their teammate’s first-ever walk-off. East, among the first to reach his teammate, might have scored the winning run but pointed toward Guty’s hit as his favorite moment of the game. Warriors Manager Andy Mook tipped his cap to the home team, but pointed toward reasons to be excited for Jupiter’s remaining games. Both teams have rapid turnarounds. On Wednesday, Jupiter plays host to West Broward, while Dwyer will prepare to face division Palm Beach’s #1 team in this week’s rankings, American Heritage.